I tried composing a blog post of thoughts on the Pope and the Synod but could not do so without gradually abandoning any sense of charity. Towards the end I basically suggested Church history might well record Pope Francis as some kind of false prophet. Its best I don't publish it, but it just goes to show 'gradualism' isn't all its cracked up to be. You start out with good intentions but soon enough all hell breaks loose and even the good that you started out with ends up being thrown away. 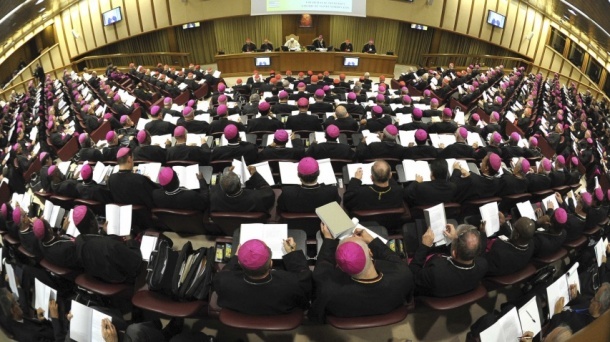 Whatever takes place during this Synod, Pope 'Nothing you can say will offend me' Francis has quite possibly laid the groundwork for the biggest war in the Church since the last one, and just short of the 500th anniversary of the Reformation and the 100th anniversary of the Fatima apparitions. The time to choose your 'tribe' seems to be fast approaching. I give you, readers, the eerily prophetic, 'Frankie Goes to Hollywood'. "Don't be afraid to offend me" said Pope Francis. So Cardinal Kasper can more or less suggest what Jesus Christ said is "offensive". The Pope is not offended. No, no. You can insult Christ and His teachings all you like and the Pope is not offended. "Hey, Frankie, sorry, Your Holiness, I read that new book published by that Socci guy. I reckon he's right. This whole two Popes situation doesn't add up. I'm not completely certain you are a validly elected Pope and I'm not wholly convinced Benedict XVI's resignation is valid either!" "Security! We've got some gossipers here!" Oops, I've done it again. Oh well, a little sin doesn't matter, does it? In time I'll overcome it. Gradually! I agree with Pat Archbold. Bishop Satan of Gehanna, Germany, is certainly present at the Synod. Does anyone know when his next 'intervention' will be? Will it be published? I hear he's one of the Bishops supporting the Kasper proposal. Gradualism is definitely his thing. "Oh go on, its just a little act of disobedience...its of no consequence really..."
I guess that Kieran Conry can feel hard done by. It's only natural in this pontificate that the former Bishop should be confused about the moral law and the difference between right and wrong. I'm sure he'll be publicly repentant one day. Gradually. I share (I hope) the charity of Torquemada, universal rather than particular. For the good of the Church, I hope for a swift end to this Papacy. P.S. I shall quite understand if you delete this. "Whatever takes place during this Synod, Pope 'Nothing you can say will offend me' Francis has quite possibly laid the groundwork for the biggest war in the Church since the last one, and just short of the 500th anniversary of the Reformation and the 100th anniversary of the Fatima apparitions." Better its out in the open than festering away like it has been for years. Pius X oath against modernism was a disaster because it forced it underground, where it grew unseen like a Hydra. What I want to know, is when will the hate mongering bigots who oppose polygamy allow us to marry ? We are tired of the incredible discrimination that is showered upon us. Wouldn't it have been more opportune to have put a video up of Frankie's "Relax", after all isn't the (goodness knows how many homosexual prelates') Synod of the Family (oh, funny day), weaning the laity into accepting homosexuality. Sheesh, I almost put up the "Body Double" video of 'Relax' up. I must be getting corrupted, what with all this intense discussion about adulterers and 'gradual' repentance. Well Laurence, I'm hoping you'll gradually become more merciful (though perhaps not soon.... there'd be precious little left to read!). But I'm hoping the good God is not gradual at all in ending this entire debacle, and bringing His Church into line, before your merciful debut; there is so little to cheer us on! And I thank you for the Pat Archbold link. I don't read them often because, you know, NCR. Let the innovators have their day in the sun, It will all end in tears of course . This is corrupted and corruptive. What a wicked mind is behind such perverse ideas. Damask Rose, they aren't weaning acceptance, they are forcing it. The Pope already has endorsed it with his promotion of pervert Msgr. Ricca. Our Lady of Quito is also known as Our Lady of Good Success. The prophecies for the mid-20th century were made nearly 500 years ago and are alarmingly spot on. I am making a novena to her now and am passing out holy cards of her. Who Lit the Blue Touch Paper?